This great Apache warrior defied and eluded Federal authority for more than 25 years. Even though never allowed to return home they would not even allow his body to be sent home. Then a few years later George Bush's Grandfather Prescott Bush a Yale man. He and some of his brothers stole Geronimos head. This is a petition to have Yale, Bones and Skulls Fraternity to return the head of Geronimo. Once the head is returned then the request to have Geronimo intack body to be sent back to his Native Land. This is something that must be done. The Chiricahua Apaches have for years protested to our Govt. to no avail. We never kept one promise to any American Indian Nation. We kept one said Chief Black Kettle. That the white man would take their land. They kept that promise. Let us all click on this site and sign the Petition. Thank you all, Cee / Cutter . In 1876, Federal authorities captured and forced Geronimo and his band onto a U.S. reservation at San Carlos, Arizona. It was described as "Hell's Forty Acres." He soon escaped and fled to Mexico to resume the life that he loved. Geronimo roamed Arizona and New Mexico and was persued relentlessly by more than five-thousand U.S. troops. Exhausted and hopelessly out numbered, Geronimo surrendered in 1886. His band consisted of a handful of warriors, women, and children. Geronimo, along with a few hundred of his fellow Apaches, were shipped by box-car to Florida for imprisonment. Geronimo was relocated to Fort Sill, Oklahoma and on February 17, 1909, as a prisoner of war, unable to return to his much loved homeland, died of pneumonia. He is buried in the Apache cemetery at Fort Sill, Oklahoma. The slaughter of Geronimo's family when he was a young man turned him from a peaceful Indian into a bold warrior. Originally Goyathlay ("One Who Yawns") joined a fierce band of Apaches known as Chiricahuas and with them took part in raids in northern Mexico and across the border into U.S. territory which are now known as the states of New Mexico and Arizona. Geronimo was the last Apache fighting force. He became the most famous Apache of all for standing against the U.S. government and for holding out the longest. He was a great Apache medicine man, a great spiritual leader. 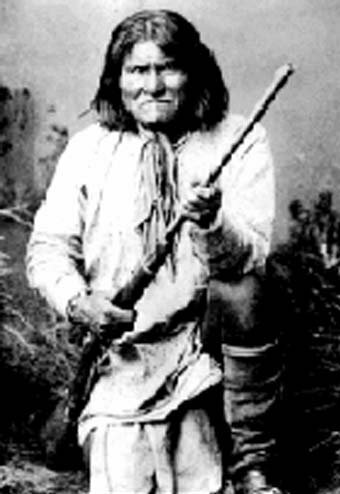 Geronimo was highly sought by Apache chiefs for his wisdom. He is said to have had magical powers. He could see into the future and walk without creating footprints.